I had to call my brother the minute I saw the headline in this story about me in the Indianapolis Star. I read the headline out loud and sure enough, he laughed until he started coughing and had to stop for fear he might lose consciousness. Or worse. Perhaps you've had that experience of laughing with someone, especially a family member, so hard you have some understanding of the phrase, "died laughing." In our family system, to "worry" about something or someone is to show love for it. Our mom worries a lot. I mean all the time. We kid her about it. When she says, "I worry about you, Jim," I respond, "I love you too, mom." One time I took a trip to California. When I returned I called her and mentioned I'd taken this trip. "Already?" she cried, because she knew I was going at some point. "I'm so sorry I didn't worry about you while you were gone!" See, for my mom, worrying is a magical system of protection. And, yes, she really means she loves me. So, as you read this headline, substitute the word "worries" with the "loves." 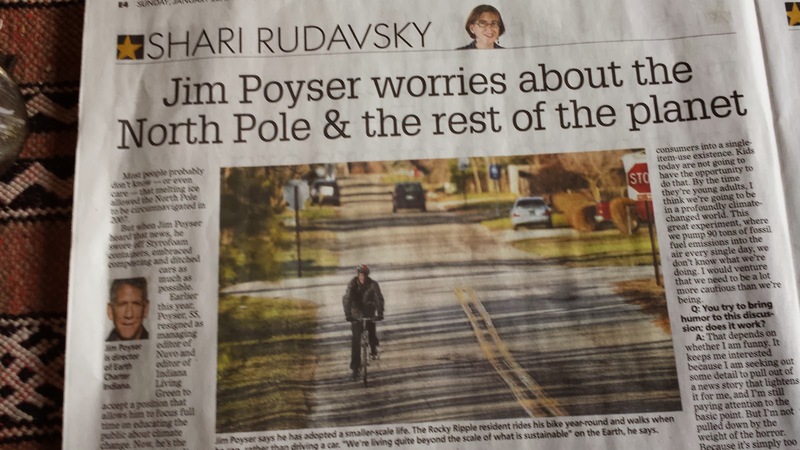 Jim Poyser loves the North Pole and he loves the rest of the planet. And he loves his mom, too.